Search from a list of over 60,000 scholarships. 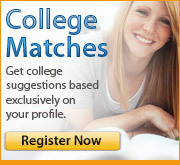 Select one of the following options and get scholarship matches for FREE! In order to conduct an Advanced Scholarship Search, you will either need to login above or create an account.